Ashley by one of the new bins on Cressingham road. 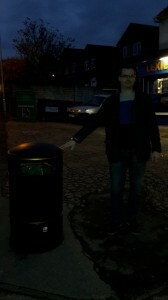 After Councillors had heard of residents concerns about litter on Cressingham Road they have managed to secure two new bins on Cressingham Road from the Council. Outside of Lexie’s newsagent and slightly further up Cressingham you can now find new bins that will be emptied weekly. Hopefully this helps keep the road cleaner for residents. This entry was posted in Ward News on February 26, 2015 by Ashley Pearce.